drains lead to the ocean” includes all the pharmaceuticals that go down the drain one way or another. 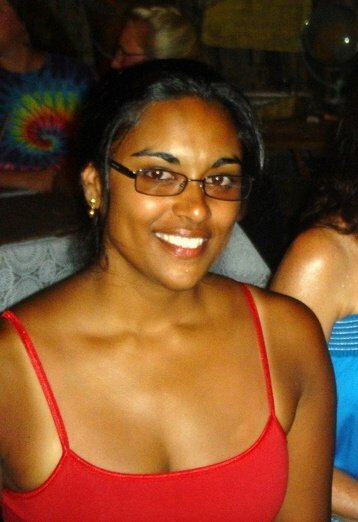 She is Indian-American; born in New York, but raised in Indiana, and is very comfortable around rednecks and dive bars. Rumya’s journey to the Broad Lab has been anything but a straight line. She started out with a B.S. in Studio Art, concentrating in Sculpture, which was followed by a stint as the office manager in a law firm (because that is the obvious progression from art school). She then took the next logical step and got a B.S. in Biological Sciences, specifically aquatic environments. Having finally found a focus, she followed this with an M.P.S in Fisheries Management and Conservation at University of Miami. After her Masters, Rumya continued her research while working for The Nature Conservancy on Caribbean fisheries vulnerability and Disaster Risk Reduction, and also for Dr. David Die (UM) cataloging historical fisheries stock assessments for ICCAT. Later, as the Citizen Science Coordinator for the Key Biscayne Community Foundation, she helped write a Sea Level Rise Adaptation Plan for the Village of Key Biscayne. To make sure she is covering as many bases as possible within the field of marine science, she is starting her Ph.D. in marine toxicology, because somewhere in the middle of everything else she published a random toxicology paper. And to be as well rounded (or insane) as possible, Kenny has advocated including law school also, which would begin in her second year. Watch Rumya explain what sea level rise could mean for Miami on the Weather Channel here.